Afternoon Tea at the Shanghai Ritz Carlton is served in the Lobby Lounge, a room that was completely full with patrons and hotel guests on this February afternoon in Shanghai. I decided to wait for a few moments in the hope that a table would open up, and I would be able to have afternoon tea here. I waited, waited, and waited. 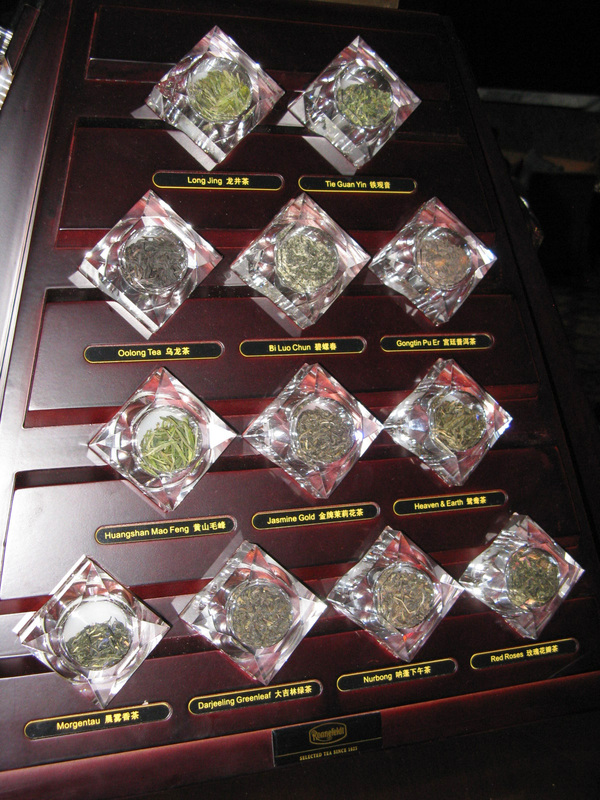 An elaborate display of whole leaf teas, all labeled and behind glass enclosures, caught my eye, so I spent some time observing the actual leaf behind many of the famous teas I had sampled in my travels. That was an early indication to me that this establishment is serious about their tea, and I decided to wait even longer. Since nothing was becoming available, I decided to ask the staff if I could take afternoon tea in the Bar, and they said yes, of course. Even though it was somewhat unorthodox, I decided to do it. I would take one for the team, as it were, so I could report back to you, my loyal readers, on another afternoon tea experience in China. 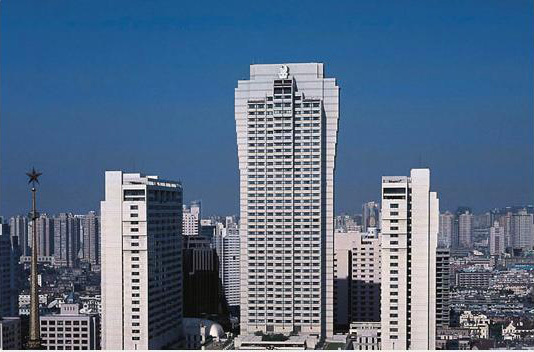 The Portman Ritz-Carlton Shanghai is a luxury hotel located in a fashionable shopping district on West Nanjing Rd (Nanjing Xi Lu). It’s a large complex in a modern, high-rise facility containing 600+ rooms. 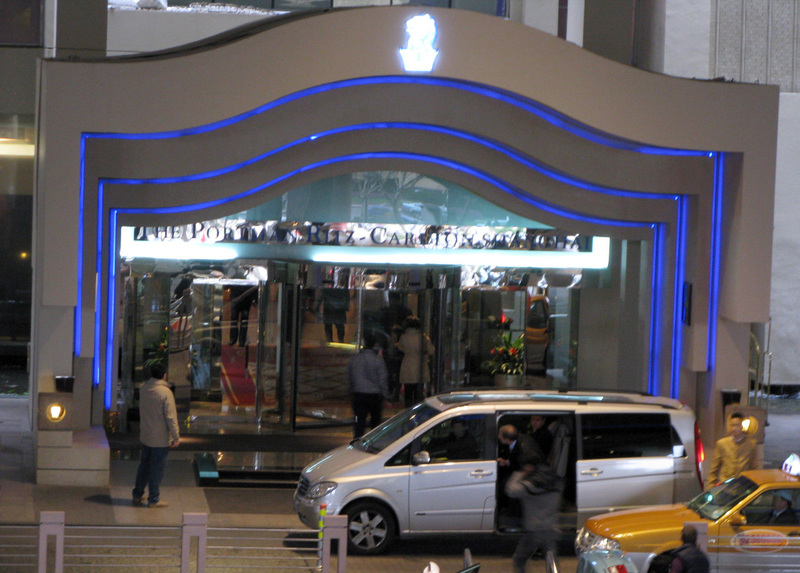 The Lobby Lounge menu listed several afternoon tea options – The Imperial Tea, The Emperor’s Tea, The Sandwich Tea, The Pastry Tea, and The Fruit Tea. I opted for the Emperor’s Tea, because instead of scones and finger sandwiches, it included Chinese Dim Sum – the first time I ever experienced this classic Chinese dish in place of the more traditional afternoon tea fare. The staff advised me that the dim sum takes about 30 minutes to prepare, so I turned my attention to the tea menu. A live piano player provided background music and included some old American classics, like The Shadow of Your Smile (from the movie, the Sandpiper). I enjoyed the pot of tea for about half an hour while the dim sum was being prepared, and the staff periodically added hot water to the teapot as I was waiting. At that point, the three tier stand arrived with a steamer basket full of dim sum on the uppermost level. Of course, I was drawn to this top level first – the dim sum fillings included shrimp, pork, a seafood combo (this was the best – it had a spicy kick to it), and Chinese vegetables. They also served a vinegar-based dipping sauce in a side bowl. What a great way to have afternoon tea – Emperor’s style! 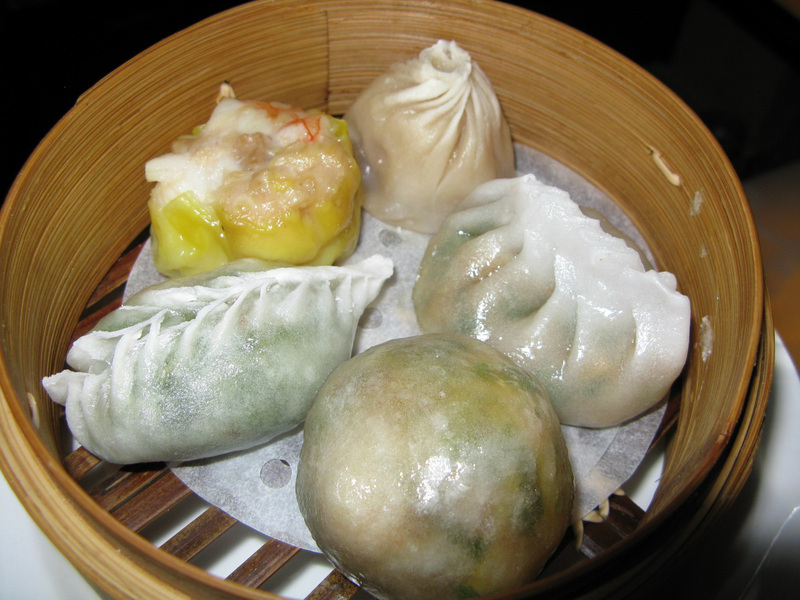 There were no scones, no finger sandwiches, no clotted cream, but rather a local and historic specialty – dim sum, a dish that is intended to be taken with tea. Of course, I wasn’t disappointed that the Emperor’s Tea three-tier stand also included two full levels of sweets and confections. The long jing tea, the dim sum and the sweets afterward made for a great afternoon. Even though I was seated at the bar, there was plenty of good people watching to be had. From what started out as a probable “no go,” this afternoon evolved into something quite unique and interesting. It was certainly unusual having afternoon tea at the bar but it was well worth it, because not only were there no tables when I arrived, there was no tables when I left, either. 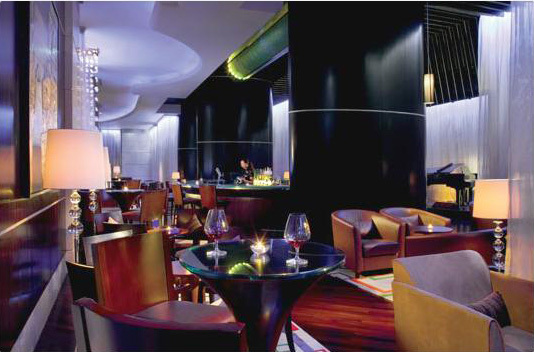 In other words, if it weren’t for my suggestion to sit at the bar, I would not have had an opportunity to have the Emperor’s Afternoon Tea at the Portman Ritz Carlton in Shanghai, China. This entry was posted in Asian/Pacific Teas and tagged afternoon tea, china, dim sum, high tea, ritz carlton, shanghai. Bookmark the permalink. Looks like a wonderful afternoon tea. 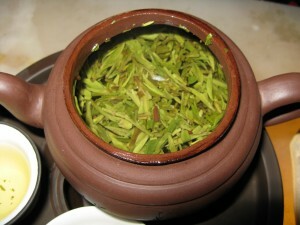 I got a chance to try Long Jin tea once and it is smooth and delicious. Miranda Geng Public Relations Coordinator The Portman Ritz-Carlton, Shanghai, No. 1376 Nanjing Xi Road, Shanghai P.R. SHANGHAI, CHINA – December 8, 2016 – The Portman Ritz-Carlton, Shanghai redefines the traditional afternoon tea experience at The Ritz Bar Lounge.